Before you go any further, you need to find out what kind of APU you have. Look in the upper right corner. If you see a silver box that reads SHVC-SOUND, then you have one of the first SNES decks. 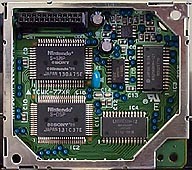 If you see two chips under the heatsink, then you have a revised SNES. If you see only one chip under the heatsink, then you have the last revision of the APU. These units are rarely found in North America, but seem to be popular in Europe. 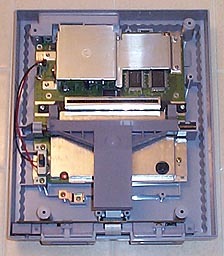 If you have the old style SNES, you'll need to remove the APU module in order to get to the DSP. Do this by removing the two screws in the opposite corners of the module, then pulling the module straight up to disconnect it from the main board. Next you'll need to take the lid off the underside of the module (the side with the 24-pin connector). Slide a small standard screwdriver under the lip on one of the sides. Carefully push the lip off the module. Do this on each side until the lid comes off. 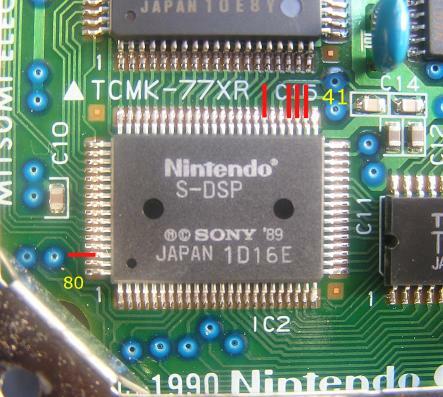 If you have the newer style SNES, you're going to need to get the heatsink off in order to get to the DSP. If you have the older style with the APU module, removing the heatsink isn't necessary, but it could make adding the output connector easier. 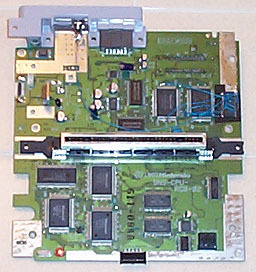 The heatsink is held on by three or four screws on the underside of the mainboard. So to get it off you'll need to take everything out. There are seven or nine screws holding the mainboard in place (four silver, three or five gold). You'll need to remove the power switch to get one of the gold screws out. 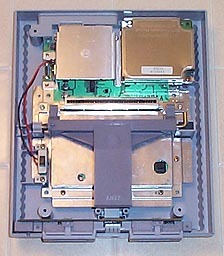 Before removing the mainboard from the SNES case, remove the screw holding the voltage regulator to the heatsink. Flip the board over and remove the screws holding the heatsink on. When was the last time you used the RF adaptor? If your home theater system is sophisticated enough that you need an S/PDIF out, then you probably won't be using the RF adaptor with your TV. I mention this because the RF out is a good place to put your S/PDIF connector. This way you don't need to drill any new holes in your case. The shielded RF box thingy is held on by three screws, one on the top and two on the bottom. Once you take the screws out you'll need to use a soldering iron to disconnect the four pins from the main board. Rather than draw up a schematic, I've made a table of the pins you need to connect. The S-DSP column contains the pins you need to connect to if you have a two chip APU, and the S-APU column contains the pins you need to connect to if you have a single chip APU. 1 Instead of grounding to the DSP, I soldered pin 28 of the CS8405A to the mainboard and tied all grounds there. This doubled as a way to anchor the chip. 2 The documentation for the CS8405A would indicate that this pin needs to be set high, but this appears to be incorrect. Using the clock signals from the DSP results in synchronous operation in the CS8405A, but the output from the DSP isn't exactly 32kHz. As you can see here, my SNES is outputting samples at about 32040Hz. (Though you can't see the detail in this picture, the upper trace is of the 16-bit samples and the lower trace is the sample clock.) This shouldn't be a problem unless you're trying to sync S/PDIF devices or your input device insists on using its own clock. The CS8405A allows for asynchronous operation. 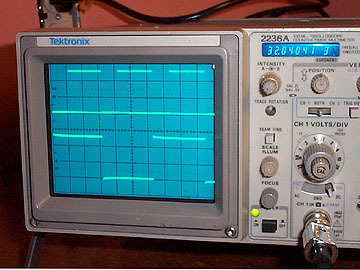 So, if necessary, you can supply your own master clock (OMCK) by using a more accurate crystal to ensure 32kHz output. However, doing so will result in samples being dropped or repeated. You can decide on the output connector you want to use. If you're going to use a Toslink (optical) connector, the TXP pin can be used to directly drive the output circuit. If you want to use a coaxial (RCA) output, you'll need to throw in a couple of resistors to drop the voltage down to the consumer grade 0.5 volts. Here's the final product. I don't have a very good digital camera, or I'd have put up better pictures. As the CS8405 is getting hard to get these days, here's a connection diagram for the CS8406. And I thought a pic of the pins on the DSP might be useful. The clock, data, and reset pins are all in the same place. just a couple differences in what goes to ground / Vcc. In regards to the AUDIO pin note above, the CS8406 datasheet is corrected with the AUDIO line low for valid audio data. I got so frustrated trying to solder wires to the DSP inside the APU can I ended up giving up on analog audio and lifting the pins. Don't do this! This will result in a nice black screen. It's all better now.